Great cover I have one for my bike and one for sisters bike, tough quality and looks good, no scratches in bike when cover in place. As others have said before me, this is worth paying for, if you don't have a garage this will protect your bike, with its fleece lining to protect your paint work, to its fully waterproof outer layer, plus the vents keep the moisture at bay. Fits my Vespa T5 perfect! Very good fit. Medium size fits my GSXR750 perfectly. Good quality. Bought to replace my Oxford Storm cover that I bought about 4 years ago which was starting to fade and lose its waterproof protection slightly. This is my 3rd Oxford Stormex cover. The first went back as the tape on the seems came away after a very short time. It was replaced with no hassle by Sportsbike shop. The second one started to do the same after a few months but did continue to keep the bike dry. I went for another one because of this and that it fits my VFR1200f quite well. For the new Honda CB650R the medium size fits a treat. Quality appears to be good with nice touches like the strap that connects under the bike, window for a solar charger and access for a chain lock. Time will tell if it can withstand the elements. This ultimate bike cover features a tough outer that protects against weather and knocks and the reflective panels that increase the visibility at night is just some of the features to list of this fantastic cover. Previous customer feedback would suggest that a large cover would be the best size for your model. If in doubt the dimensions for the covers are shown on the website. What size will fit my BMW GS1200 ? Previous customer feedback would suggest that the XL cover would be best suited. If you have luggage fitted,even the XL may not fit. Have a Triumph Tiger 1150 with large top box, will the xl cover the rear wheel please? Due to the top box on your bike we don't think the cover would totally cover the back wheel. Would I be correct in assuming a small would fit a sym crox 125 scooter? Unfortunately we do not have the dimensions for your scooter, but the dimensions of the covers are listed on the website. The Forza is very high at the front due to the screen, and so you may find that only the XL cover will fit. This would however be longer than needed. Hi, what size would be ideal for KTM Duke 125? I can't find bike dimensions anywhere on the net and haven't picked up my bike from the dealership yet. Previous customer feedback would suggest that a medium cover would be the best size for your model. I have a 2018 Triumph Tiger1200 XRx can you tell me what size cover I should order? Previous customer feedback would suggest that the extra large cover would be the best size for your model. If in doubt the dimensions for the covers are shown on the website. What size cover for a 2014 Daytona 675? Previous customer feedback would suggest that a medium cover would be the best size for your model. If in doubt the dimensions for the covers are shown on the website. Previous customer feedback would suggest that a extra large cover would be the best size for your model. If in doubt the dimensions for the covers are shown on the website. Which size would be best for my 2007 Yamaha R6? Previous customer feedback would suggest that a medium size cover would be the best fit, but please compare the sizes on the chart to your Yamaha specs before purchasing. Looking for a cover for my cbr1000rr 2012 Fireblade,best fit would be ? Thinking of getting an mt09 tracer, what size of cover would I need to get for the stormex? We would recommend the large sized cover for this make and model of motorcycle. What size cover for a 1997 ZX-6R F3 please? Do you have the dimensions for the cover inside of its carrying case? Specifically for the Medium and Large models, thank you! Looking to buy the above for my '99 CBR 900RR - I intend changing shortly to buy an MT 07/09. Would a large fit them both do you think please? Thanks. Previous customer feedback would suggest that the medium cover would be the best fit for these bikes. What size would you recommend for the new Street Triple 765 RS? Thanks. What size to fit my Intruder M1800R 2013? In theory the large cover will fit, however previous customer feedback would suggest that the XL cover would be better. Previous customer feedback would suggest that a large cover would be the best for your model. If in doubt the dimensions for the covers are shown on the website. What size would I need for my 2017 Kawasaki Z1000SX? Previous customer feedback suggests that a large cover would be the best for your Kawasaki. If in doubt the sizes are shown on the website. Hi i have a BMW R nine T, what size would be best for this bike ? Although not supplied with a specific model application guide, customer feedback suggests that either the medium or possibly large size may be sufficient for the BMW. In the event of a sizing issue, provided the cover was in original unsoiled condition, it could be returned for exchange. We would suggest the size small would be suitable. You could check the dimensions against your bikes dimension to confirm: length 203cm, width 83cm, height 119cm. What size would you suggest for a 2017 800GSA? We believe a size large would be best for your model. Need to replace existing Oxford Stormex but cant remember what size I got last time, to fit BMW F800R please? We believe a size large would best suit your bike. We would recommend the medium size cover. Hi there, which size cover would be suitable for a 2014 Suzuki Gsxr 750. Regards. Previous customer feedback would suggest that a medium size cover would be the best fit, but please compare the sizes on the chart to your GSXR specs before purchasing. Hi there, which size would you recommend for a Yamaha XSR 900? Looking through previous feedback, we think a medium would be most suitable. What size would be best for a cb125f? A size small would probably be best. You could check the dimensions against your bikes dimension to confirm: length 203cm, width 83cm, height 119cm. Previous customer feedback would suggest that the large cover will be the best fit for your Blackbird. Although not supplied with a specific model application guide, customer feedback suggests that either the large or possibly extra large size may be sufficient for the Virago. In the event of a sizing issue, provided the cover was in original unsoiled condition, it could be returned for exchange. You would need the medium size cover for your Honda XR 250 motorcycle. We would suggest the large size Oxford Stormex Bike Cover for your motorcycle. We would suggest the medium size cover. We would suggest the medium size Oxford Stormex Bike Cover. Which size would be best for a Yamaha N-Max with box please? The Oxford Stormex cover is not currently manufactured in specific sizes to fit bikes with a top box. 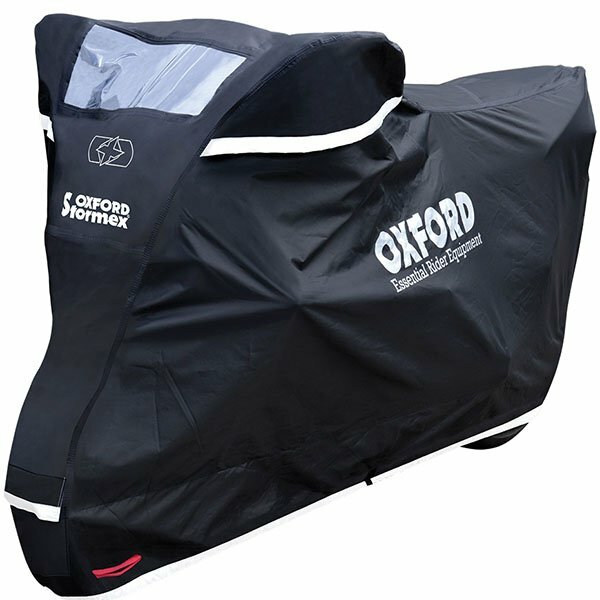 We would suggest the Oxford Aquatex Bike Cover and select the size suitable for a scooter with top box. What size would you recommend for a Yamaha XSR 700? It's coming through as a small but it's a large bike. Previous feedback would suggest that the medium cover would be the best fit for your XSR. I have a Honda CBF 125 with a top box. What size do you recommend? Previous customer feedback would suggest that the large size cover would be best suited to your bike. What size would you recommend for Yamaha MT-125? Previous feedback would suggest that the medium cover would be the best fit. Hi, what size cover for a 2013 Triumph Tiger 800 XC? Customer feedback suggests that the Oxford Stormex Bike Cover in a Large may be suitable for the Tiger 800. Hi, what size would be best for a 2017 yamaha mt 07? We would recommend a large for an MT-07. We would recommend the size medium. What size cover would you recommend for a 2014 Triumph Speed Triple 1050. Thanks. Hi There, what size would I need for a 2014 BMW GS1200? Without top box or panniers. We would recommend an Extra Large for your bike. We recommend a large for your bike. Hi, everyone. I've a 2001 Honda CB750 F2 with a top-box. Which Stormex would give the best fit? The large would be sufficient for your model. What size Oxford Stormex cover would you recommend for a Yamaha 2016 Tracer 700. We would suggest the medium size cover for your Yamaha Tracer 700. What size for a Suzuki SV650? Previous customers state that the large cover would be best for your SV650. What would you recommend for a Honda CB500 F 207.5-78.0-106.0 L-W-H all dim in cm. XL would be recommended for this bike. What would you recommend for the triumph tiger 800 xrx ? Customer feedback suggests that the Large size may be suitable for the Tiger 800. What would you recommend for a honda nsr 125 - 2002 model? I have a Suzuki DL1000 on a 07 plate with top luggage box. rear height is 140cms and 250 cms overall lenght . Can you help. You would need the XL version for your DL1000. What size cover would you recommend for a Honda CB1300 F3 2003 please. Thanks Rich. A large should be sufficient but the dimension sizes are shown in the description if you require. Customer feedback would suggest that the large size cover would be the best fit. Should the size be an issue, provided the cover is returned to us in original unused condition (including packaging) we should be able to exchange the cover for you if necessary. Hi there, this looks one of the best covers out there at the moment. What size would you recommend for my Suzuki GSX 1250F (2010) Model? We would recommend a large Stomex cover for your Suzuki GSX 1250F. We would recommend the medium cover for your Ninja 300. We would recommend a large cover for your Street Triple for the best coverage. What size of bike cover do you recommend for a Honda cbr600rr 2006 model ? Previous customer feedback would suggest that the large cover would fit your CBR600RR the best. We would recommend the medium cover for your CRF250L. We would recommend a large Stomex cover for your Street Triple. Customer feedback would suggest that the XL size cover could be the better fit. Should the size be an issue, provided the cover is returned to us in original unused condition (including packaging) we should be able to exchange/refund for you. Customer feedback would suggest that the XL size cover could be the best fit. Should the size be an issue, provided the cover is returned to us in original unused condition (including packaging) we should be able to exchange/refund for you. The large cover should be a good fit for your Sprint GT.